From pulpits to sidewalk vigils, clergy have been part of a religious outpouring against Trump's plan to suspend refugee entry from seven majority Muslim countries. Faith leaders who support the president's executive order as a way to fight terrorism have been far less vocal, ceding the religious discussion to those overwhelmingly opposed to the president's sweeping immigration order, which suspends refugee admissions for four months and indefinitely bars refugees from Syria. 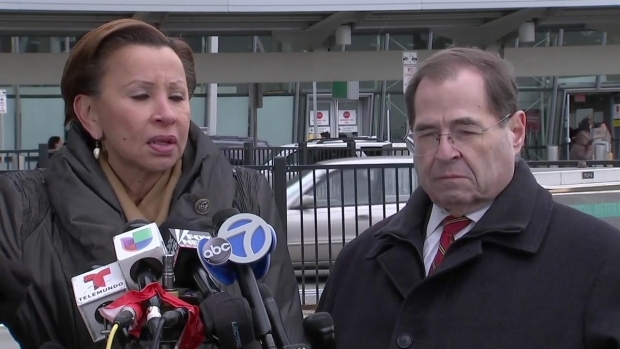 Rep. Nydia Velazquez condemns the detainment of two heavily vetted Iraqi refugees at JFK airport, calling the action "an affront to American values." The U.S. Conference of Catholic Bishops, which runs the largest refugee resettlement network in the country, said it "strongly disagreed" with the prohibitions and pledged to work "vigorously to ensure refugees are humanely welcomed." The Orthodox Union, the largest association for American Orthodox synagogues, acknowledged the complexities of fighting terror, but said "discrimination of any group solely upon religion is wrong and anathema to the great traditions of religious and personal freedoms upon which this country was founded." Trump's executive order gives preference to refugees fleeing their countries over religious persecution. The president told the Christian Broadcasting Network he aims to prioritize Christian refugees. Still, relatively few evangelicals have voiced support for the idea. Among those who did offer support was the Rev. Franklin Graham, whose aid agency, Samaritan's Purse, works with refugees in Iraq, Greece and other nations. Graham said in a statement that he backed a closer examination of refugees' views on "freedom and liberty" and that Islamic law was incompatible with the Constitution. The Rev. Robert Jeffress, the leader of First Baptist Dallas and a vocal supporter of Trump, told "Fox & Friends" television show that Trump was "fulfilling his God-given responsibility to protect this country." A few protesters gathered outside his church during services, with one carrying a sign that read, "Love Thy Neighbor." "We believe in security. We believe in careful vetting. We just don't think a full shutdown is the right reaction," said Scott Arbeiter, head of World Relief, the humanitarian arm of the National Association of Evangelicals, which resettles large numbers of refugees. "These are people who are running from the very terror as a nation we're trying to stop." Beth Hood, who attended Mass at St. Camillus Church in Silver Springs, Maryland, said her priest did not directly discuss the refugee restrictions, "but the whole tenor of the Mass was somber" and the reason why was obvious. 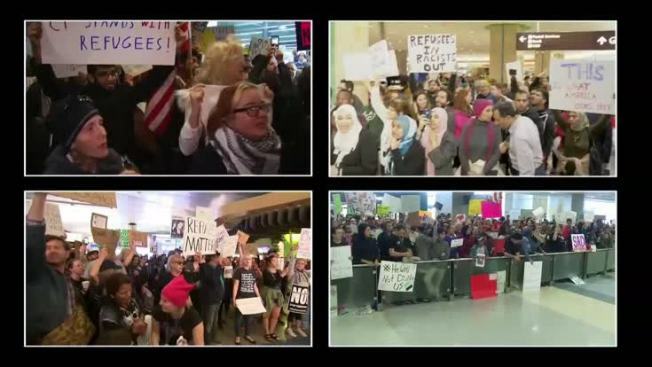 Federal Judge Ann M. Donnelly of the Eastern District of New York Courthouse in Brooklyn granted an injunction in response to a request filed by the American Civil Liberties Union and other legal organizations on behalf of individuals subject to President Trump's immigration ban from seven predominantly Muslim countries. The Roman Catholic parish serves a large immigrant population from El Salvador, Guatemala, West Africa and Bangladesh. The Scripture reading for the day was from the Beatitudes, the blessings from the Sermon on the Mount, including blessings for peacemakers. "There was just a real synchronicity between what we were feeling and readings for the day and again the somber tone of the homily," said Hood, a social worker who works with Central American immigrants. She called Trump's action "mean-spirited, abrupt and callous." 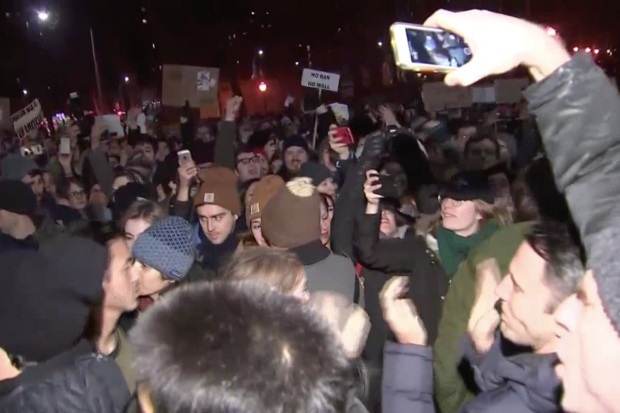 A Mass near the White House organized in protest of Trump's policy drew hundreds of participants, who knelt as they received Holy Communion on Sunday evening. Many clergy had to take special care with how they addressed the issue during Sunday services, given a mix of political views in their congregations. At Johnson Ferry Baptist Church, a Marietta, Georgia, evangelical church that resettles refugees, a pastor at an early morning service prayed that the congregation would "lift up the Syrian refugee families that we are sponsoring," noting they may never see some members of their family again. The pastor also asked God to grant "wisdom" to Trump so he would make appointments to the U.S. Supreme Court "that can protect the right to life, protect the unborn." The Rev. Gary Manning, rector of Trinity Episcopal Church, in Wauwatosa, Wisconsin, said he started revising his sermon at 2:45 a.m. Sunday, anxious to strike the right tone for his politically mixed suburban Milwaukee parish. Worried his preaching would be "not fiery enough for some and not practical enough for others," he ended up speaking about mercy and reflecting on what can be done to help others. "One of my Trump supporters walked by and said, 'Thank you for keeping it subtle. I don't think I could have handled being screamed at today,'" Manning said. "It's incumbent upon me to remember that the people in my congregation are doing their best to live out their Christian values." Episcopal Bishop Sean Rowe, who leads the Dioceses of Bethlehem and Northwestern Pennsylvania, said he has never seen such a strong, across-the-spectrum religious response to a social issue. His dioceses include programs to settle refugees, including a Syrian family that had been expecting a relative to come soon — a plan now on hold indefinitely. Rowe said he planned meetings this week with his own clergy and leaders of other faiths on what they should do next to oppose Trump's policy. "I find it outrageous at every level," Rowe said. "There's a real sense that the church cannot be silent about this."